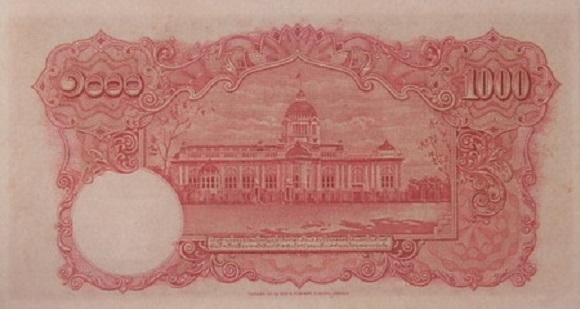 The 1000 Baht banknotes have 2 types that were printed from Thomas dela Rue. Thomas type 1 ordinary number signature Pradid VF about 104,000 - 110,000 baht. Thomas type 2 ordinary number signature Pradid VF about 95,000 - 100,000 baht. Thomas type 2 ordinary number signature Pradid F about 47,000 - 50,000 baht. 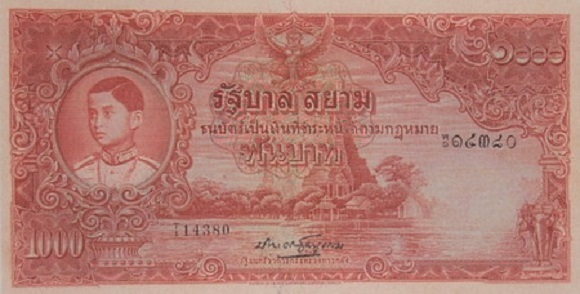 The 4th series 1000 Baht Thomas type 1 banknotes were announced on 9th January 1939. 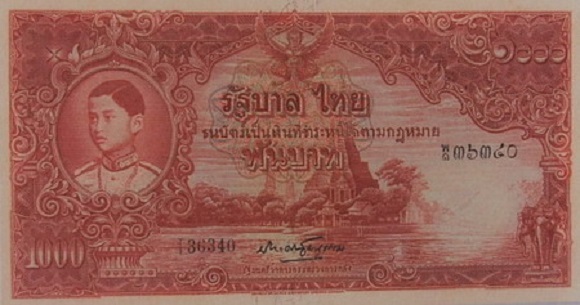 The 4th series 1000 Baht Thomas type 2 banknotes were announced on 7th Marchr 1939. The main object is the image of King Rama 8 on the left. The middle image is Phra Prang Wat Arun. The serial code and number were printed with black ink.